2011 Shelby Mustang GT500 Can you say Oh My God! The 2011 Ford Shelby GT500 is so good we don’t even want to associate the word “Mustang” with it anymore. 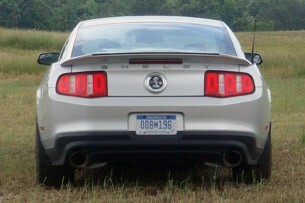 Not that there’s anything wrong with the Mustang – particularly the revised 2011 model. But as a sports car, the word “Mustang” conjures images of something much less than refined. If a Porsche is a scalpel, a ‘roided up ‘Stang is the Jaws of Life: it’ll get the job done, but it ain’t gonna be pretty. However, if a Mustang is a mauling maw, the Shelby GT500 is a defibrillator. Perhaps not pinpoint precise, but it hides a sting, a little bit of burn and you can put it right where you want. And once you’re there, you can use it to deliver a glorious shock to the system. Follow the jump to find out why. Indulge us for a moment while we play with the superficial numbers. If you chart the gap between the most basic version of a sports car and the most hallowed version, the ground the Shelby GT500 covers – and the way it covers it – is nothing short of phenomenal. 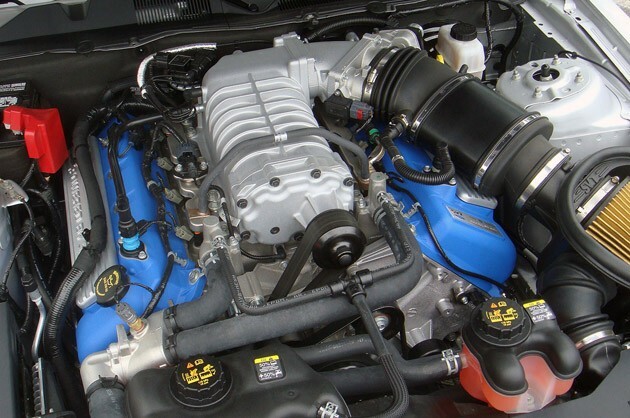 Start with a base 2011 Mustang V6. By the time you get to the 2011 GT500 you’ve added 245 horsepower and 230 pound-feet of torque. And in the process you’ve dropped the 0-to-60 time by 1.1 seconds. Now let’s compare that to some Olympians of sportscar-dom: Chevrolet Corvette (base coupe to ZR1),Porsche (Carrera to GT2 RS), BMW (328i Coupe to M3), and we’ll throw Mercedes (C-Class to C63 AMG) in for good measure. The Shelby’s 245 horsepower beats them all except for the GT2 RS, which is a 275-hp leap over the base 911. If you go with the 911 Turbo instead of the limited-edition GT2 RS, the Shelby beats that, too: there’s only a 185-hp jump from the Carrera to the Turbo. 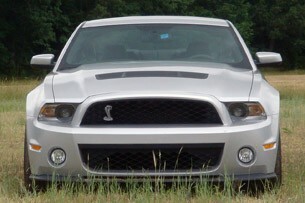 And the Shelby’s 230 lb-ft increase beats all of them. Zero-to-sixty times present a more dispersed picture. The M3 is 1.5 seconds better to 60 miles per hour than the 328i Coupe, but it and the C63 AMG remain slower than the GT500. That’s to be expected – you need a big gun to take down 550 hp. The GT2 RS and the ZR1 both get to 60 in 3.4 seconds (the Turbo PDK in 3.1), gains of 1.3 and 0.8 seconds over their respective base versions. “Aha!” you say – but wait! It’s time for the first bit of magic. The price differential between the base, $49,880 Corvette and bombastic, $109,130 ZR1 is $59,250. The difference between the $77,800 Carrera and $245,000 GT2 RS is $167,200. The M3 and C63 AMG each best their melba-toast-and-butter counterparts by around $23,000, a much more palatable difference. But a base Mustang V6 is $22,945, and you’ll only need $26,550 to quantum-leap your way to the $49,495 Shelby GT500. And that price includes the $850 destination charge. Less than $50K for a four-seat coupe with 550 hp and 510 lb-ft that’s as quick as a Corvette and quicker than a 911. If you maxed out the options list, which would mean selecting the SVT Performance Package ($3,495), Electronics Package ($2,340), glass roof ($1,995) and Shaker 1000 audio ($1,295) – the stripe-delete is a no-cost option – you’re at $58,620. And you’re still about $2,000 away from getting close enough to breathe on an M3. And we won’t bring the $170,000 M3 GTS into this because it would still lose out to the GT500. Everywhere. For everyone struck apoplectic by that last comment and screaming at the screen, “But the M3 GTS wouldwaste the GT500 on the track!” Remember, we’re just discussing the superficial numbers at the moment, but we hear you, and we’re getting to that. And that is where we get to the improvements wrought upon the 2011 GT500, done so in the way of the best sports cars: not one big change, but a bunch of small yet very important changes. The aluminum block for the 5.4-liter V8 and the 102-pound reduction from the front end have got all the play, but it wasn’t just the switch to aluminum that did it. An evolution of the Ford GT block, it was co-developed with 102-year-old German firm Honsel, specialists in lightweight metallurgy. The casting employs a bulkhead chilled process that increases block stiffness. Bore cylindricity was improved for tighter tolerances. The cylinders don’t have steel liners – they’re coated using a Plasma Transfer Wire Arc process. It’s a practice common to aerospace but was previously prohibitively expensive for automotive use. The short of it is a 35,000-degree plasma jet melts a 150-micron-thick steel coating onto the interiors of the cylinder. The coated cylinders produce less friction without steel liners, and cooling is improved since the liners aren’t there to heat insulators for the chambers. Going without liners saved 8.5 pounds, and the Blue Oval says the engine performs better than the Ford GT. There are forged aluminum pistons and forged steel connecting rods and crank, with six-bolt billet main-bearing caps. 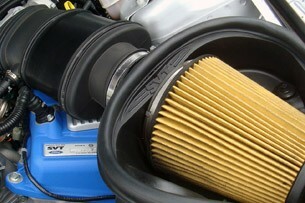 The wet-sump lump uses an integrated oil pan gasket and windage tray, and larger cast-in drainbacks minimize aeration. Electronic Power-Assisted Steering (EPAS) with solid bushings replaces the 2010’s hydraulic setup, and even with the Z-brace to it firm up, steering is another weight-saver. 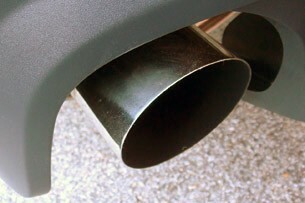 The new, 2.75-inch exhaust creates 38 percent less back-pressure. That exhaust is also louder. Know what else? The engine returns a 15/23 EPA rating, and avoids the gas guzzler tax. Boo-yeah. But wait, there’s more. 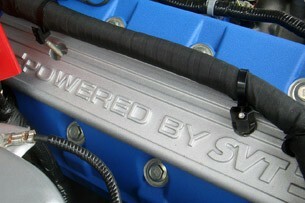 A larger, twin-row intercooler is 40 percent better than the single-row intercooler on the 2010. 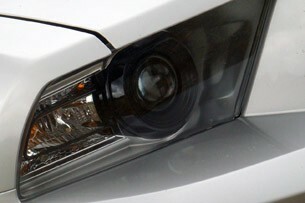 A new undertray that runs to the front axle makes the car more aerodynamic. The coupe rides 11 millimeters lower up front and 8 mm lower in back, while front brake cooling has been bettered with redesigned venting. 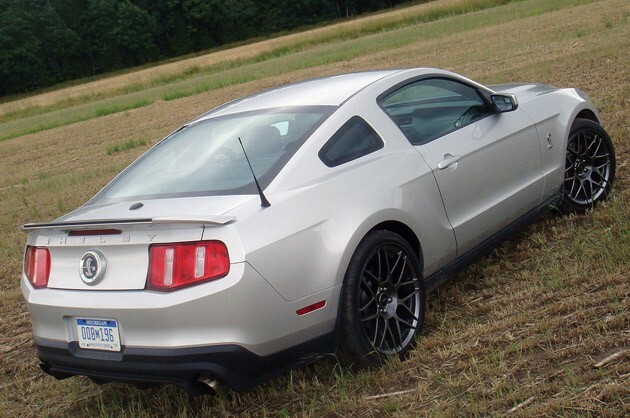 Upgrade to the Performance Package and a 3.73 rear end is swapped out for the 3:55, firmer suspension with increased spring rates, damping and roll stiffness, a Gurney flap on the rear spoiler, that white gear shift knob and the so-far-unloved thin Shelby stripes. 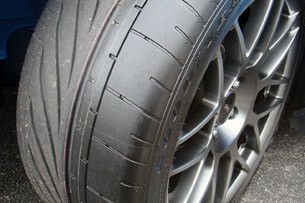 And then there’s the rubber on the Performance Package cars: Goodyear Eagle F1 Supercar Gen-2 tires. SVT worked with Goodyear to create them, coming up with a unidirectional, corner-specific tire that wraps forged aluminum wheels that are 19 inches in front, 20 inches in back. The multi-radius tires have a center groove with an aggressive, big-block pattern outside and water-channeling grooves inboard. SVT engineers said that although they’re about as close as you can get to a race tire, in their tread testing, they managed about 15,000 miles before hitting the first tread-depth wear marker. 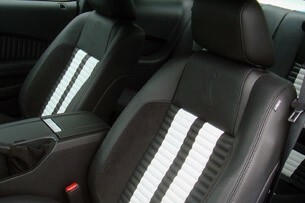 And for now, they are only available on the ’11 GT500. The wheels save 15 pounds altogether compared to the 2010 model, and the whole car weighs 3,820 pounds. So, without further ado, let’s talk handling. We said that the Mustang appears to have sorted out its issues with handling, and we used the word “appears” because our civilian drive route covered the back-country of North Carolina that suited the car. The car is stiffer everywhere and feels it – the 2010 GT500 is almost plush by comparison – but it is a supple stiffness that remains comfortable. 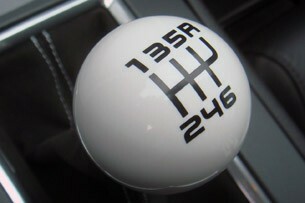 Hit a hard bump and you’ll know it, but thank all the saints that the 2011 doesn’t jump around like last year’s model. The Roush 427R remains our standard for a properly tamed Mustang rear end, with the 700-hp Shelby Super Snake right behind it. The 2010 GT500, though, was positively frightening when we drove it on the bombed-out tarmac of the Northern California Pacific Coast Highway. The indigestion it suffered while trying to swallow its cratered surface practically bounced the Shelby into the oncoming lane often enough for us to get off the gas and pretend we were driving home from church. The 2011 GT500 ran over everything and did it well enough that we didn’t even think about it – a certified triumph over its near ancestor, though it wasn’t as dramatically challenged in Carolina. On almost all surfaces, the Goodyears were fine – exhaust noise ruled the day and wind noise was hushed. Get on just the right kind of bad road, however, and the tires roared something fierce, the vibration seemingly made worse by resonance in the cabin. But it only happened once, and you have to find that road to make it happen. 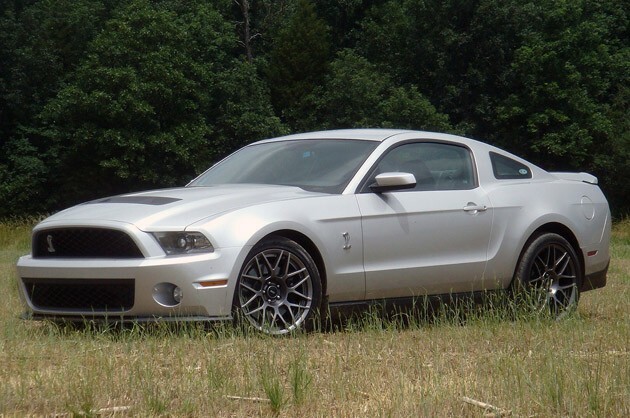 We’d like to get the 2011 GT500 on some L.A. roads to see if the same suspension issues arise as were suffered during Drew Phillips’ 2010 GT500 review. Until then, we’re happy to give the 2011 a ‘Drastically Improved’ on its report card. The test the SVT team really wanted the car to pass would happen at Virginia International Raceway. Unlike past events, there was no drag racing course and no figure-eights – just the 3.27-mile full course with 23 turns including hairpins, esses, incline and camber changes and tricky concrete curbing. What we found after nearly 10 laps in the 2010 and 2011 cars was that the 2011 GT500 is massively better in every way than the 2010 – with the exception of three areas. 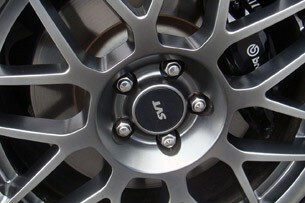 The clutch was great, especially for a car with 550 horsepower, but the short-throw mechanism has such latitude that we constantly felt we were in sixth when we were only in fourth. We also found it notchy and occasionally hard to get into gear. Unless there was an orderly, deliberate progression through the gears, we spent more time searching for cogs, third most of all, than we would have wished – something we found to be an issue during our recent Sports Car Comparo. 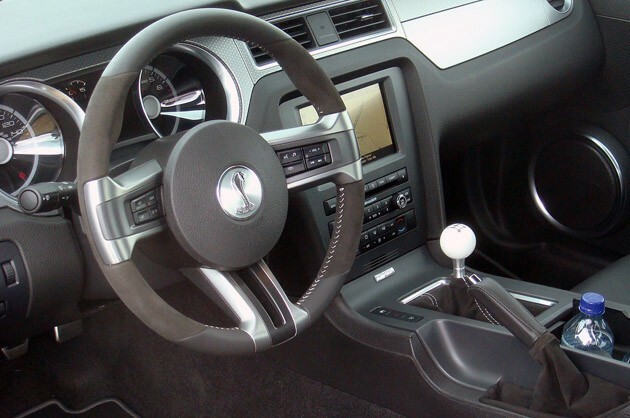 The electrically assisted steering was as responsive and precise as the hydraulically assisted unit in the 2010 GT500. That can be seen as a triumph, as the software finesse necessary to maintain feedback could have easily sent the SVT team over a cliff. It did not. Would we have complained about the steering being a little quicker, or loading up even more as lock was applied instead of feeling like it plateaued? No. Nevertheless, it feels just like the tiller on the 2010 and we never wondered where we were putting the wheels or what they were doing. But on the go, the 2011 GT500 whips the 2010. Again, it’s tempting to put it down to the 100 fewer pounds up front, and while that’s certainly helped, all of the changes have reworked the entire attitude of the car. Braking hard for a turn is, of course, where you would most notice the 2010’s heavy nose, sending your concentration up front to deal with understeer as the car hunkers down and you start calculating the angles and physics to get an anvil around a hairpin. After the apex, the 2010 has 540 hp that you can’t exploit until you get the nose to stop pushing on for the grassy verge. Even on the straights, the car squirms under power, not only due to the horses underfoot, but because the rest of the car is trying to balance itself around the cast iron lump and the Cirque de Soleil act takes some time to nail down. Run through high-speed esses and its pendulum time. Crest a rise and you need to wait a noticeable moment for the coupe to settle down again. 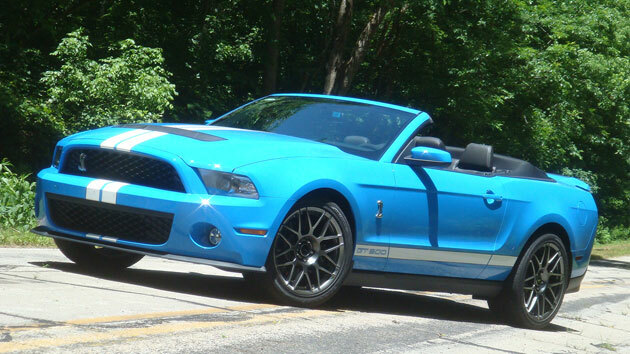 Don’t get us wrong: the 2010 GT500 is a very, very good car. We asked “Where do we sign?” when we drove it, and we stand by that. We’re only talking about it like this because the 2011 is that much better. The 2011 jumps off the line and pushes you even harder into the seat as you shift into second and third. It also does so for longer: with a better intercooler you hold onto max power longer. Whereas the 2010 had been run a while and began to lose a percent or two because of the heat and resultant decrease in air density for the supercharger, the 2011 wouldn’t quit. Braking hard into a turn and the 2011’s lighter weight up front, better balance, firmer and more supple suspension and Supercar F1 Gen-2 tires take your mind off of math and let you just focus on hitting the apex. The car remains settled throughout turns, meaning you can dial in additional power sooner and stay on the track. We ran through the flat esses faster. We ran through the uphill esses faster and all without the 2010’s four-step of “crest, float, settle, power.” After the tight hairpin at Oak Tree, we could get on the gas so much more quickly that we added 10 mph before having to brake for the chicane set up halfway down the straight, getting up to almost 130 mph instead of 120. Through the twisting downhill section at the back of the course, by the time we got the tires to start groaning, we were pushing ourselves hard enough to simultaneously hope that we weren’t about to do something to make the tire wall groan. None of those things are down to one change on the 2011 GT500. This is not about an aluminum block or more horsepower or a new suspension or new tires. Likewise, this is not about getting on the power earlier or less understeer or more grip. This is about enough little improvements everywhere that have created a vehicle that is more confident, more balanced and more capable – and so it can be driven faster and harder and better – everywhere. That brings up one final note: Some will say, “Take a $32,845 Mustang GT Premium and add $17,000, and you can beat the Shelby.” This we will again counter with what we now call The Raptor Argument: your GT-plus-mods doesn’t come with all-as-one-piece OEM engineering, testing and durability. Nor an OEM warranty. Could you beat the Shelby? Probably. Could you build something comprehensively better than the Shelby? We won’t say you couldn’t – but we’d like to see you do it. Welcome to the 2011 Shelby GT500. At this point in our defibrillator process, we’re standing back and looking at the sizzle marks on our chest, letting the high-voltage buzz wear off. And we’ll admit, the 2011 Shelby GT500 might not save lives, but it can sure as hell make them better.